an exciting sense of pending celebration. When Easter arrives, Greek families come together for feasting, drinking, and dancing. No matter what village and island you visit, you will notice that Greeks tend to have specific superstitions. While the exact guidelines of the superstitions differ from village to village, there are general symbols that almost all islanders will recognize. For instance, when visiting the islands you will notice that almost all shops sell small “evil eyes” to ward off jealousy and misfortune. The presence of garlic is common, as that is thought to prevent bad luck and evil spirits. On the Greek islands, most of the people are always friendly and willing to help if you get lost or have a question. 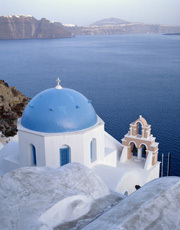 The Greek people are proud of their islands and want to share with you the beauty and history of their land. sections of Mykonos are quainter. For instance, Little Venice has shops hanging over the water, reminiscent of a time when islanders had to be careful for pirates when unloading goods from ships. You will also find outside markets that have been village tradition for decades, and continue to sell fresh produce to locals and tourists alike. We’ve provided listings for some of the top restaurants in Greek Islands including Crete, Mykonos, Santorini, Rhodes and more. You’ll find lavish gourmet restaurants, affordable restaurants serving up good food, and everything in between. Sample traditional Greek cuisine or other specialty cuisines that are sure to make your taste buds happy.